Kansas guard Marcus Garrett (0) falls over Villanova forward Eric Paschall (4) after knocking away the ball during the first half, Saturday, Dec. 15, 2018 at Allen Fieldhouse. The last time Kansas and Villanova met before Saturday, back in March at the Final Four in San Antonio, the Jayhawks had plenty of Villanova players to focus on. 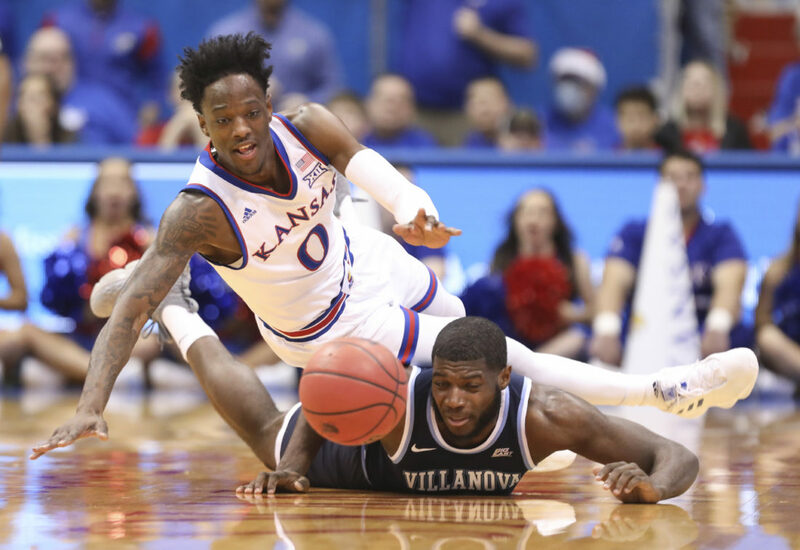 In the rematch, a 74-71 dog-fight victory by top-ranked Kansas at Allen Fieldhouse, there was one Villanova player who stood out above all others. And Bill Self put his best defender on him. 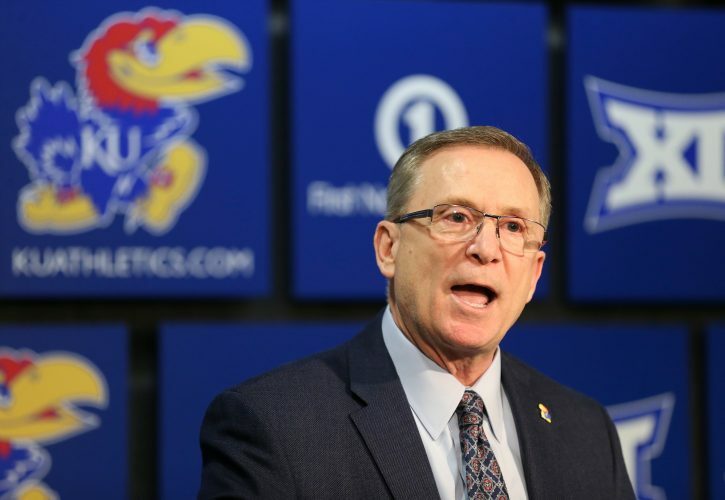 Despite giving up three inches and roughly 50 pounds to Villanova senior Eric Paschall, KU sophomore Marcus Garrett did what Self said was “a fabulous job on Paschall” on the defensive end. Foul trouble limited Paschall to 33 minutes — his season average — during a game in which he might otherwise have played all 40. And he played just 14 minutes in the decisive second half, attempting three shots and failing to grab a single rebound. “After Paschall got going (early), I thought (Garrett) was terrific on him,” Self said after the victory. The 6-foot-5 sophomore’s success against one of the nation’s toughest covers was largely the result of a week’s worth of work. Throughout the days between KU’s win over New Mexico State at Sprint Center on Dec. 8 and Saturday’s win over Villanova — KU’s third Top 25 victory already this season — Garrett studied Paschall’s game on film, from all angles and all seasons. Wherever Paschall went, Garrett was not far from him. During one possession in the second half, when KU freshman Devon Dotson found himself caught on Paschall after a switch, Garrett recognized it, worked his way over to Dotson and quickly passed off his man to Dotson so he could get back on Paschall, all within the flow of Villanova’s possession. 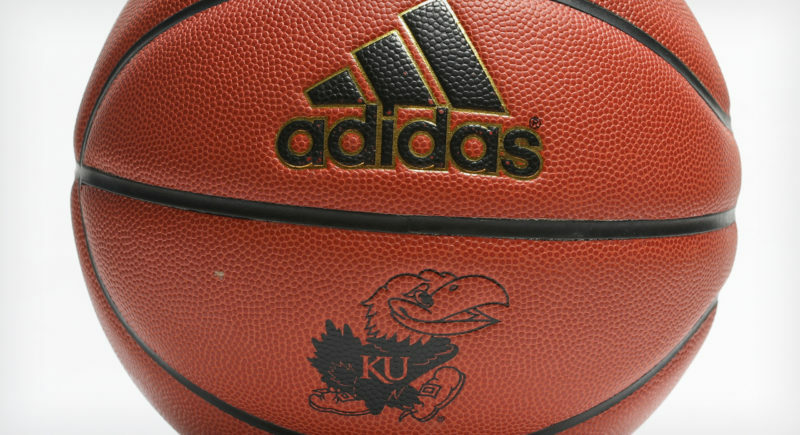 It’s plays like those, along with his ability to force Paschall into 4-of-10 shooting while recording four steals and a block, that had his teammates highlighting Garrett’s key contributions after a victory that featured a 29-point outburst from senior Lagerald Vick and yet another double-double (28 points, 12 rebounds) from KU junior Dedric Lawson. Asked how he was able to pluck so many steals from a team known for taking care of the ball, Garrett briefly explained his thought process on defense. 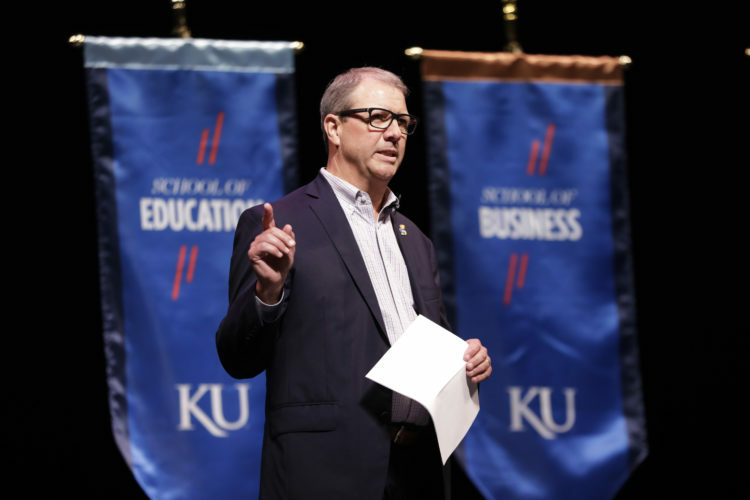 For a team with so many options on offense and so many potentially different looks with the lineup, Garrett has quickly become one of the Jayhawks’ most important players. 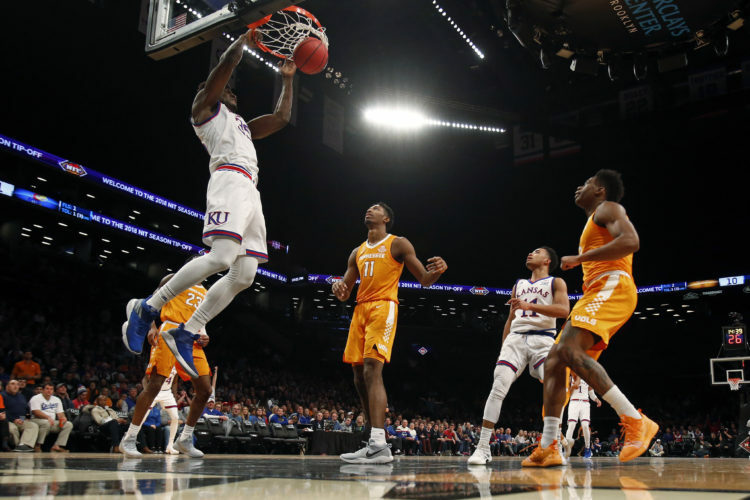 Inserted into the starting lineup because of the ankle injury to starting center Udoka Azubuike, Garrett’s ability to play four positions and be this team’s lock-down defender has endeared him to his head coach, who places extreme value on versatility and toughness.